Photo by Melinda Stuart. 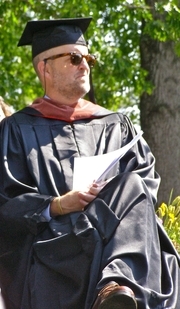 Tony Earley, on the stage at Warren Wison College (WWC) Commencement, 2010, just before delivering the invited Address. Earley is a WWC alumnus. The highly anticipated return of Tony Earley, celebrated author of "Jim the Boy"
Two decades after his debut collection Here We Are in Paradise (LB, 2/94) heralded Tony Earley as one of the most accomplished writers of his generation, the rueful, bittersweet, and riotous stories of "Mr. Tall "reestablish him as a mythmaker and tale spinner of the first rank. These stories introduce us not only to ordinary people seeking to live extraordinary lives, but also to the skunk ape (a southern variant of Bigfoot), the ghost of Jesse James, and a bone-tired Jack the Giant Killer. Whether it's Appalachia, Nashville, the Carolina Coast, or a make-believe land of talking dogs, each world Earley creates is indelible. Tony Earley reads from A new short story. ; Ravi Howard reads from Like Trees, Walking: A Novel. ; Pearl McHaney reads from Eudora Welty as Photographer and Occassions. ; Becky Gould Gibson reads from Aphrodite's daughter. Tony Earley , Jim the Boy. Tony Earley , The Blue Star: A Novel. Tony Earley reads from The Blue Star: A Novel. Tony Earley's book Mr. Tall was available from LibraryThing Early Reviewers. Tony Earley is currently considered a "single author." If one or more works are by a distinct, homonymous authors, go ahead and split the author. Tony Earley is composed of 4 names. You can examine and separate out names.